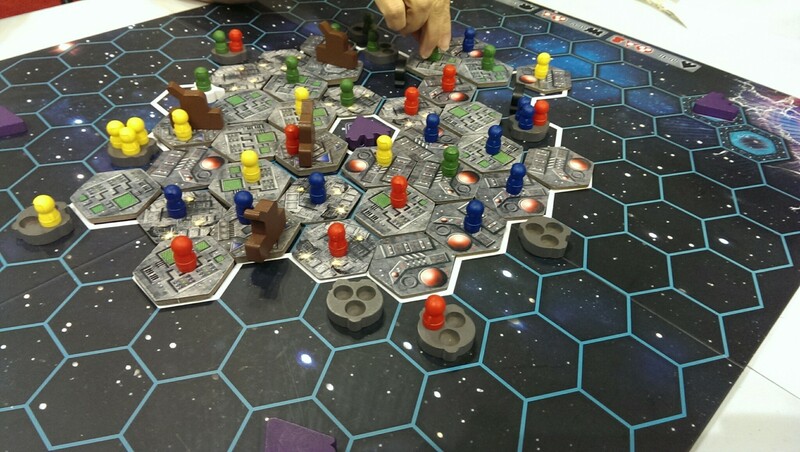 If there’s one way to get my attention, it’s to set a board game in space. 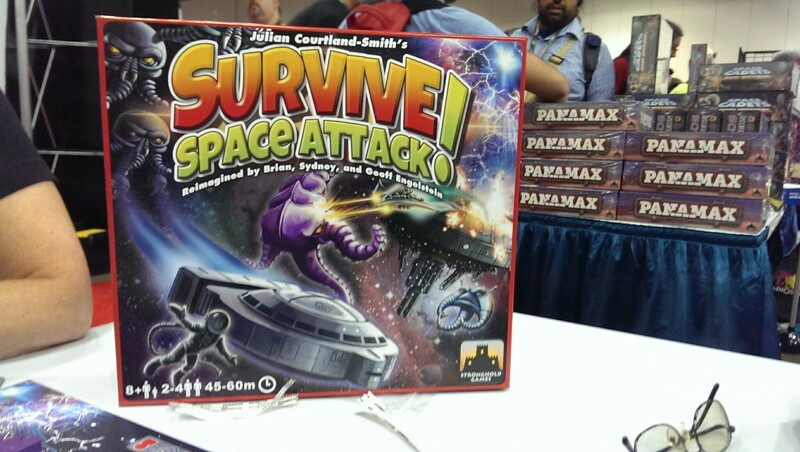 And that’s exactly what happened to the classic Survive: Escape from Atlantis in a new Space version called Survive: Space Attack! Ooh, Survive is my favorite game. That’s the one where I try to eat you and you try to survive as long as you can, right? Who it’s for: Strategy-minded people who enjoy making aliens eat their friends. Wait, where exactly does the ! go? Survive! has been a pretty popular game, but I never actually got around to playing it. Cue space music and stars in my eyes, and here we are and it’s 2015. Survive! Space Attack just makes sense. In Survive in Space, you’ve got a crew trapped on a space station during an alien attack. As the station slowly disintegrates, you’ve got to get your people to safety using escape pods by bringing them to warp gates. Unfortunately, besides the destruction, you’ve got a bunch of aliens flying around eating your escape pods and your crew. And you don’t really care about the other player’s guys; in fact, if you can get the aliens to eat them instead, all the better. It works like this: once your meeples are placed throughout the station, players take turns getting three actions, a tile draw, and then rolling the alien die. 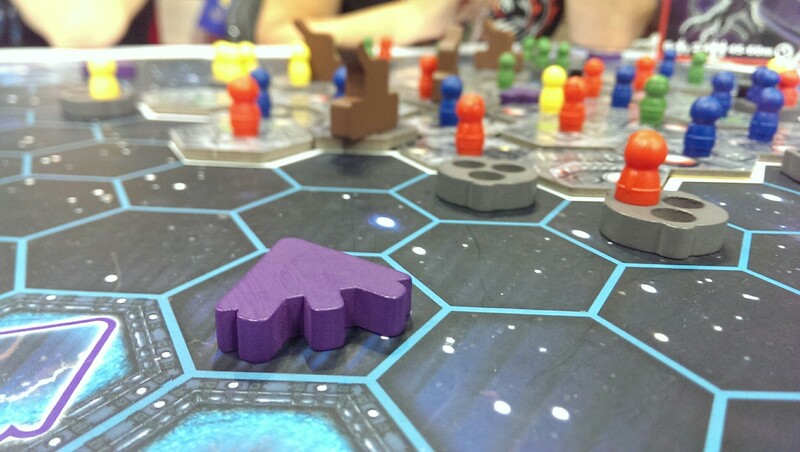 Your actions can be used to move your meeples, move escape pods (occupied by your crew, or unoccupied), or fire turrets to kill aliens. (There’s also a small version of the escape pod, a single-seat fighter, that can kill aliens by moving into their space). You then draw a tile – aka a piece of the starbase – which might spawn new aliens, or grant special powers for you to use later. 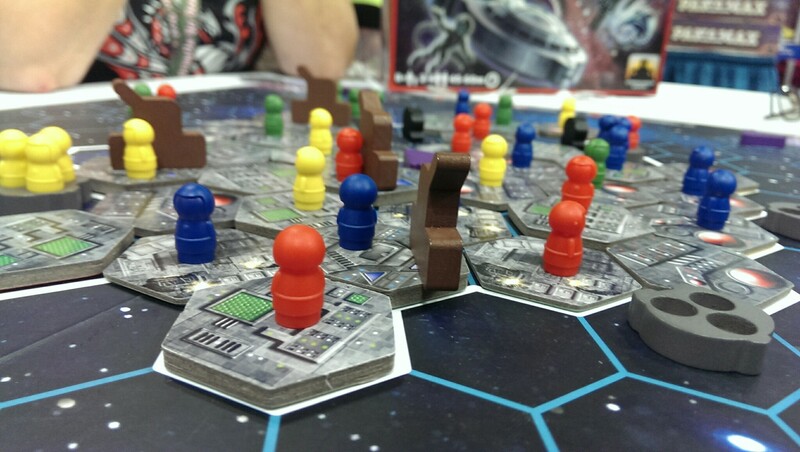 Fortunately for your meeples, they’re all wearing space suits so they don’t die in space – it’s just a lot harder to move. And vulnerable to alien feastery. Finally, you roll the alien die, which allows you to move an alien piece (and potentially allow it to eat something). Oh, and when you kill an alien, it’s not gone – you get to place it back on the board at the start of your next turn. Anywhere. Bwahahaha. Survive is perfectly cutthroat. Don’t expect a whole lot of survival here – the aliens are everywhere, and the other players are after you. Escape pods will get eaten. Meeples will get devoured. Destruction is everywhere! I suppose someone could make it unfun by having a personal vendetta against someone rather than going for easy opportunities or targeting the leader, but the devouring and destruction is spread pretty evenly. I had a blast with this game, and I would definitely play again. Fans of survive might find that not a lot has changed between the Atlantis version and this (I am unfamiliar with the original, so I can’t speak to changes), but if you haven’t checked out Survive! Before, now might be the time. I have the Atlantis version, and I actually think that Space Attack will be very different. Turrets that can fire back, single-seater ships that can shoot, and the ability to place monsters back on the board anywhere you want are alone very significant differences. It looks like Space Attack may end up being the “nastier” game in terms of player-to-player conflict (though still relatively tame). I’d say there is room for both on the shelf, as the base game is tons of fun and GREAT for new boardgamers/the unitiated, but these games aren’t the cheapest due to great component quality.